This paper chameleon heart craft is a great accompaniment to the children's book The Mixed-Up Chameleon by Eric Carle. Tip 1: Include the message "I can't hide my feelings for you!" Tip 2: Glue the heart animal paper craft to the front of a folded over piece of construction paper or a doily to make a cute Valentine's Day card. 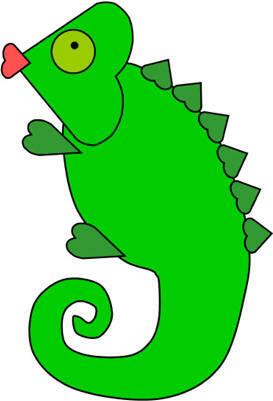 Tip 4: Scotch tape a straw or popsicle stick to the bottom to make a chameleon puppet. Tip 5: Glue a small piece of sandpaper on the back to make a felt board character. Print out the Valentine's Day template of choice. Glue the mouth and eye onto the head. Glue the feet onto the body. Glue the scales onto the back.